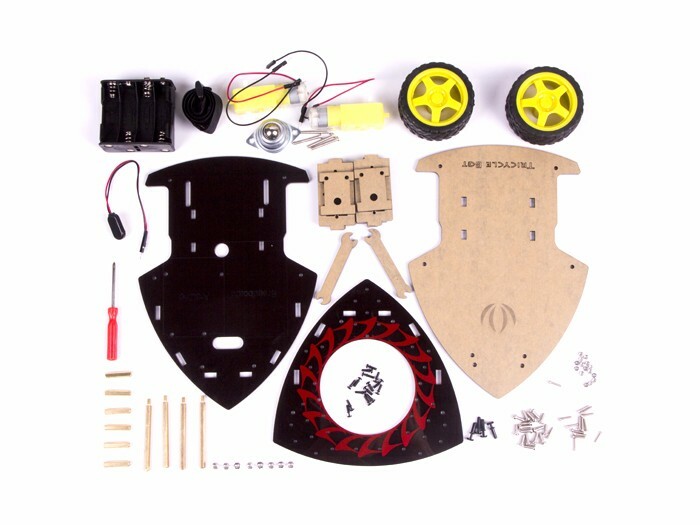 The Tricycle Bot is an easy-to-assemble and Grove compatible DIY Robot platform for education. It includes the eletronic materials and structure materials which could be assembled easily via the guideline. The Tricycle Bot has three floors and five shores between the 2nd and 3th floor, the 3th floor can be fixed with quite a lot of modules via screws and nuts. To make the bot more powerful, you can fix an Arduino board and breadboard as the heart of the robot in the 2nd floor and each shore can be fixed 1-2 plug-n-play Grove modules as the wings of the robot to strengthen the functions accordingly, such as RGB LED and ultrasonic Grove module. The supply voltage of Tricycle Bot is provided by a 12V battery holder. This kit does not include the Arduino/Genuino 101 and breadboard.